Warzone: Atlanta is rapidly approaching and I have been working on what to take. 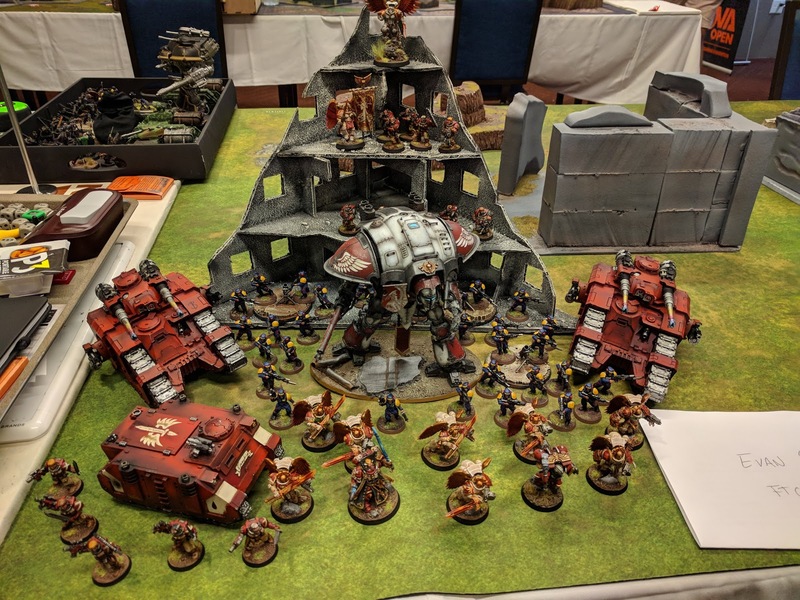 I am leaning toward my Blood Angels lead Imperial lists, adapting off the list I took to NOVA last month but between the recent Fall FAQ and painted model availability, I am feeling a little limited on the list itself. The list started with 12CP and generally spent 4 or 5 pregame to take two Blood Angel Relics (Angel's Wing and Veritas Vitae in most games) and give the Knight a Warlord Trait and/or Relic. Even beginning the game with 8 CP was usually enough with the Grand Strategist trait and two CP regenerating relics. Obviously this list could no longer support the same level of CP use with the change to how they are regenerated. Additionally, I was actually borrowing the Guard models for NOVA and do not plan on borrowing any again. One of my main goals is to max the Warzone Atlanta painting rubric, which includes points for theme and squad markings and I cannot guarantee I can get those points with borrowed models. This leaves me with the options of trying to hero through painting a Guard battalion or changing the list somewhat more radically. Focusing on the Blood Angel portion of the list first, a fair bit of the list could be on the chopping block. The Sicarans never felt very impactful, but this was in no small part because they tended to be target priority for my opponents, with one or both dying turn one in 6 of 8 games. The Rhino was there in part because of the NOVA Engineers secondary mission. It also provided a nice boost to Mephiston's movement turn 1, which is the only purpose it would have in an updated list. The Sanguinor felt a little underwhelming at times for his price point, as did the Sanguinary Ancient; however, both provide buffing auras that are hard to quantify and could be missed. As for what could replace any of these, my buddy Adam, from Army Painter and the Best General, is helping me out and painting up some more Marines for me, giving me access to a bit wider collection of Troops and characters. Specifically this could allow me to replace the Guard I don't own with a second Battalion of Blood Angels, as point-to-CP inefficient as that is. Another tweak would be to replace the Sicarans with Armiger Helverins, making the Super Heavy Auxiliary detachment a full blown Super Heavy Detachment, pushing the list up to 16 Command Points to start. The points differential is minimal, with the main cost being losing out on the Heavy Bolter shots. The two units are otherwise extremely similar in terms of positioning, defense, and output. I managed to get a game in last weekend, post-FAQ, against a Guard Battalion and Brigade, as well as a Blood Angel Battalion of three scout squads, a Captain, and a Librarian Dreadnought. I definitely made several misplays in deployment and turn 1 positioning which cost me, but I also came away somewhat dissatisfied with the list. In part because I was facing so many bodies, I felt the loss of the Heavy Bolters from the Sicarans. On the other hand, I rolled pretty abysmally for the Helverins, which colored my perceptions a bit. Keeping the Helverins would free up my options to drop the Ancient, who feels a little costly for what he provides. I also faced the temptation to waffle back to having the Guard Battalion because it provides such utility in the backfield and late game. With just about 5 weeks until the event I'm feeling uncomfortably unsure of what I want to bring. So, I am open to suggestions. What should I look to add, remove, or change about the list?